Joining our staff of counselors or volunteer Junior Counselors (ages 14-17) is a great opportunity and an incredible experience! We are currently looking to hire high-quality counselors and are always welcoming to any volunteers that would like to help out or join our Junior Counselor staff. Please contact our camp director for more information about the possibility of helping out at Trinity Woods. Summer will be here before you know it! Choose from one, some, or all of our 10 one-week sessions. Our Day Camp Program is from 9am-4pm, but we also offer extended hours from 7:30am-6:00pm at no additional charge. Trinity Woods Summer Day Camp is a Christian setting where kids, ages five to thirteen, can have summer fun where they enjoy it most-OUTSIDE! 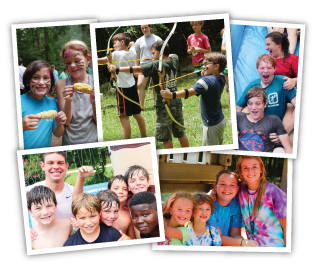 Trinity Woods Summer Day Camp is a Christ-Centered outdoor experience where campers get to enjoy nature around our lovely 17 acre Trinity Woods and Trinity Creek. For returning campers, you make login to your account and click on the Camper Application link in the forms section of your home screen. Please Note: Since we are a summer operation, during the off season we don't have staff onsite to answer phone calls. Email is the best way to contact us! If you would like to speak to one of our directors, please email and they would be happy to give you a call. Please use the form below or email any questions you have to campdirector@trinitywoods.org. Mail or dropoff checks during open house. We are currently getting ready for the upcoming camp season. Registration will be open on March 1st. Check back for more information on Open House or follow us on Facebook for news and updates. 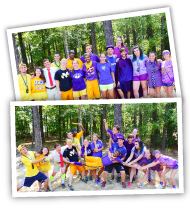 2016 Camp Theme - Unleash the Power! 2012 Camp Theme - Who am I?